Located on the scenic eastern coast of the island of Malta, the Mediterranean Conference Centre has firmly established itself as one of the most impressive conference venues on the European continent. The centre’s unique history and imposing architecture have undeniably played a key role in it securing such a position, with a past and charm that set it apart from other, less personable destinations. The historic building that now houses the Mediterranean Conference Centre was, for more than two centuries, known as the Sacra Infermeria, or the Holy Infirmary of the Order of St John. Constructed in the latter half of the 16th century, this architectural landmark boasts a fascinating history that includes a series of functional transformations, all designed to help the centre to accommodate the changing needs of the surrounding area. In 1979, the Sacra Infermeria underwent a full restoration and was subsequently converted into a modern conference centre; a transformation that saw the building being awarded the coveted Europa Nostra award for superb restoration and its tasteful amalgamation of old and new. A variety of special features make the Mediterranean Conference Centre truly unique: situated far away from the cluttered atmosphere of high-rise meeting destinations and the din of city centre traffic jams, the conference centre has all the technical benefits of an ultra-modern venue while situated in an oasis of historical tranquillity. Each meeting hall is equipped with its own independent sound, lighting and climate control systems, with conference facilities including simultaneous language interpretation systems, ADSL, Wi-Fi and a range of high specification audio-visual equipment. Across its range of venues, the centre can seat more than 2,300 delegates at any one time. 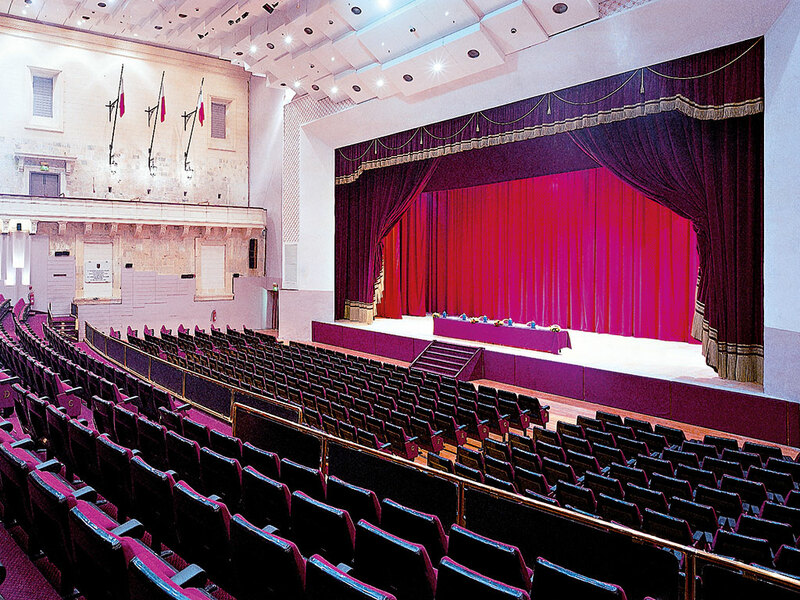 Spread over an area of 7,000sq m, the conference centre boasts a total of eight conference halls and four syndicate rooms: the largest and most impressive auditorium, Republic Hall, can seat up to 1,400 guests in theatre style. During the building’s restoration, this impressive and imposing venue was built in place of the original Sacra Infermeria’s main courtyard. The expansive 728sq m area was tastefully roofed over, thus creating the largest auditorium space in Malta, where old masonry and modern technology are blended seamlessly together. The hall is perfectly complemented by deep red theatre curtains, comfortable seating and yellowed old stone arches. Moreover, the centre’s smallest conference hall, La Cassiere, can accommodate up to 60 guests and offers an intimate space for exclusive catered events and small-scale seminars. At 155m in length and 1,700sq m in total area, the Sacra Infermeria Hall is the main exhibition hall in the centre. Known as the Long Ward in the original infirmary, the hall is one of the longest such spaces in Europe and was deemed an impressive architectural feat when it was originally constructed in the 16th century. This magnificent setting is regularly used for catering functions: the Sacra Infermeria Hall is capable of accommodating up to 1,500 people comfortably seated, or over 2,500 for standing cocktail receptions. 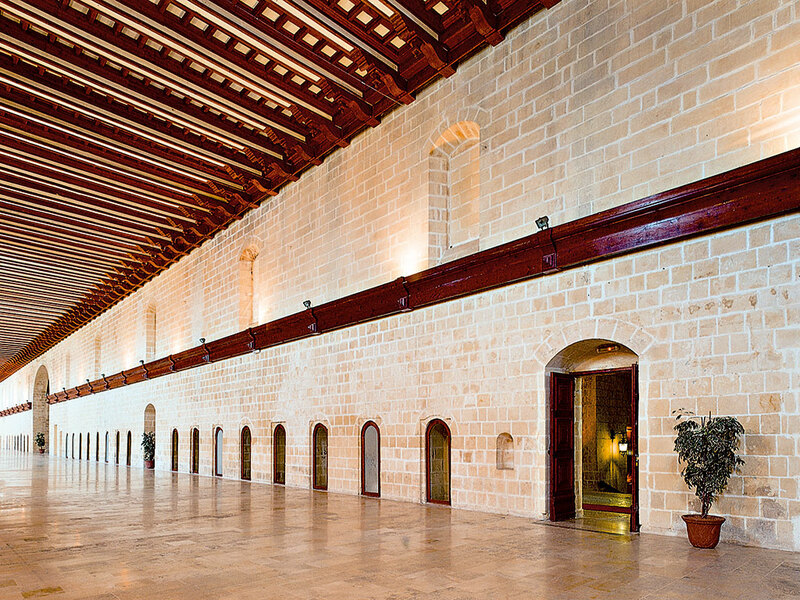 The La Valette banqueting hall is unique to the island in many respects: with a seating capacity of about 900 persons, it is the largest dedicated space in Malta, covering an area of 1,500sq m. Its vast yet graceful vaulted ceiling is one of its most awe-inspiring features, where stunning 400-year-old frescos have been carefully restored. Candle torches and coats of arms of the knights of Malta set an elegant, historical scene for formal dinners and banquets.